Ever since I created my first Crochet project "Mr Red" back in 2010 I promised to make my father-in-law a soft toy. He is an avid collector of soft toys so after a little think I opted for a sheep. It was also an opportunity to mastered another technique - loop stitch - I like to set myself a challenge. The pattern has been adapted from Craft Passion 'Little Timmy'. Thank you. 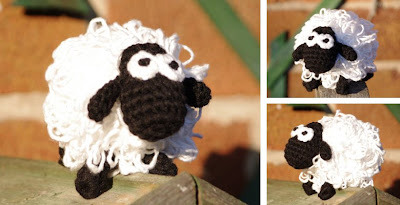 Luckily Bob has a soft spot for slight mishapen toys so my wonkey legged sheep (ran out of yarn) will feel right at home. He now sits pride of place on the mantel piece. Aaawwww! Or should I say Baaaa! Check out the link for ear muffs at the bottom of the Craft Passion page - So cute!